The gates to the Seymour Memorial Hospital were erected to commemorate those from the district who served in World War One. The gates were originally unveiled in November 1927 after ten years of planning. The Gates were built by returned soldiers at a cost of £412 and list many of those from the district who served in World War One. The gates were moved in 1959 to the entrance of the new hospital, and then again in 1996 to their current location but over the years the Gates became badly degraded. 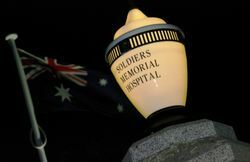 In 2004 the RSL refurbished the names on the granite pillars, in 2012 the Gates were refurbished and in 2013 the lights were replicated and fitted in time for the Anzac Day dawn service of that year. On arrival at the Memorial Hospital Lord Somers was received by a guard of honor of the 20th Light Horse, under the command of Lieut. -Colonel Crawford, a large, contingent of returned men, boy scouts and girl guides, and a crowd of over 1000 people. In dedicating the memorial to the 33 heroes who had made the supreme sacrifice and the 174 residents of the district who had served at the front, the Governor said we often heard of the ideal of an international brotherhood: but if the war was to achieve its lesson there was no need to reach for any exalted international aim. We might begin nearer home, and lay the foundations of an inter-State brotherhood, and from that proceed to the brotherhood of Empire amongst our own kith and kin. People here could achieve Empire brotherhood by keeping their money in the country instead of sending it abroad, and people at home by asking for the fruits of Empire`s enterprise. He wanted to tell the diggers that the King was personally grateful for their sacrifice. He recognised the work the diggers had done, and that they, forming a small unit of the vast army, had gone a long way in bringing victory to the Empire. (Applause). Age (Melbourne), 14 November 1927.